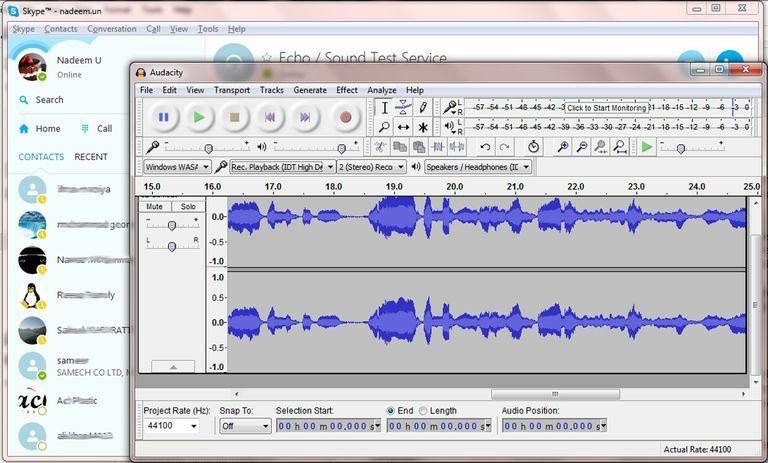 Although Audacity is a powerful free and open-source recording and editing application for audio, it suffers from one significant limitation: It only allows a single audio-in feed. Because VoIP calls in Skype, or group-chat conversations in Discord, require both inputs and outputs, Audacity cannot natively record both halves of the conversation. You cannot record Skype calls in Audacity out-of-the-box. The solutions we've outlined assume you're using Audacity 2.1 or higher, Skype 8.4 or higher, and Windows 10 version 1809 or higher. Use a dedicated VoIP recorder to record the audio, then insert the file into your Audacity project. Starting with version 8, Skype itself supports call recording natively — but only for Skype-to-Skype calls. Consider apps like Pamela to record your Skype calls outside the network, then place the file into Audacity for subsequent editing and mixing. It's unlikely that older "Skype call recording" apps work. With Skype 7, the underlying APIs (the technical framework for how data works under the hood) changed significantly. If an app advertises itself as working on Windows 7 and Windows XP, it almost surely will not work on Windows 10, because modern Skype's APIs are so radically different. Use two computers. If one computer handles the Skype conversation or the Discord chat, push that computer's audio-out into the audio-in of a different computer running Audacity. Many experienced podcasters or streamers use this approach. It requires a second computer and some dedicated hardware (like a mixer or patch cables) but it's a bulletproof solution if you can afford the gear. Monitor the audio on loopback. In Audacity, because you can specify only a single audio-in connection, you can configure the application to record either the remote party (e.g., your caller or your friends in a group audio chat) or the local party (i.e., you with your microphone, talking into Skype or Discord). You can simulate both halves of the conversation in Audacity if you set the remote caller as the audio-in and then, in Windows Settings, change your microphone's settings to monitor it. The audio quality will be awful for your voice, but in a pinch, it'll work. In Audacity, change the MME setting in the toolbar to Windows WASAPI and change the audio-in to the loopback version of the speakers you're using on the Skype call. In Windows, go to Settings > Sound and select the input device you're using for Skype. Click or tap Device properties, then in the next screen, select Additional device properties. When the Microphone Properties dialog box launches, select the Listen tab then select the Listen to this device checkbox. This setting repeats everything your mic says, to your speakers. The "listen to this device" approach will not yield good audio quality for your part of the Skype call. Get clever with speakers. If you've got more than one audio-in device, configure Skype or Discord to use your external speakers and, for example, a webcam microphone. Then configure Audacity to record using something like a Blue Yeti mic that's capturing the audio coming from your speakers and your own natural voice. This approach may not work for some people, and it may be challenging to nail Audacity's audio quality, but it just might work for some people. Mix individual tracks. Especially if you're working to create a polished final product, you may find value in having every participant in a Skype call record his or her own version, then have one person use Audacity to blend these files into one clean version that, as a bonus, doesn't necessarily sound like a VoIP call. The real challenge is Audacity's single-line-in recording logic. However, this problem isn't unique to Audacity. The Windows platform relies on its sound card to compile audio-in and audio-out feeds. More advanced sound recording tools, like Adobe Audition, will experience the same challenge in a Windows environment. However, Macs generally do not have a similar all-or-nothing audio-management requirement baked into the operating system. Professionals using Windows usually opt for a dedicated external mixer, so that all inputs and outputs route to a hardware device, and that device's output may serve as a unified input for feeding into Audacity. Can You Change a Song's Speed With Audacity? Can I Record a Call With Google Voice?